This is not a photo of the Gemini command module (CM) that I encountered at the Glen L. Martin Institute of Technology in the 1970's. 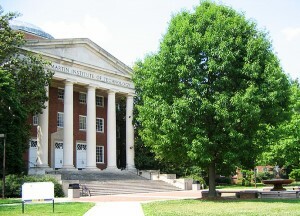 Glenn L. Martin Institute of Technology (now the A. James Clark School of Engineering) at the University of Maryland. While surfing around on some NASA websites today, I suddenly had a recollection of an experience from way back in the 1970's that probably puts me in an exclusive club of space program enthusiasts. During my junior high and high school years, class work always seemed to be interfering with my activities involving building and flying model rockets and airplanes. My grades duly reflected that fact. Most off time then was filled with transforming balsa trees into flying objects, with the help of a straight-edge razor blade, some sandpaper, Duco cement, and butyrate dope. Add in all the accessories from Estes and Cox that my paper route would afford me, and I managed to gain quite a bit of experience in the art of model flight. If you look at my high school year book, the "Future Plans" inscription under my pathetic photograph mentions something about attending the University of Maryland (I lived in Annapolis then) for aerospace engineering. The only problem was that at the time, I could not factor a square if my life depended on it. In fact, my only knowledge of a square was in relation to the number of shingles on a roof top. I had not yet managed to make the critical connection between higher math and engineering. That would come later while serving in the U.S. Air Force. Determined to at least be able to truthfully say that I had indeed gone to the University of Maryland, my good friend and flying buddy, Jerry Flynn, and I would make occasional trips to the Glenn L. Martin Institute of Technology*, located on the University of Maryland campus. In one of the buildings were many laboratories filled with some of the most magnificently cool pressure chambers, wind tunnels, materials testing contraptions, machining equipment, jet engines, sections of airplanes wings, and as good luck would have it on one memorable occasion, an honest-to-god Gemini space capsule (command module - CM). It stopped me in my tracks when I saw it. 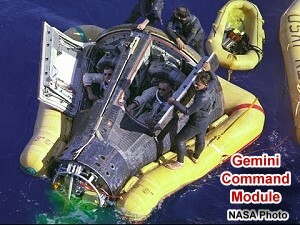 There, sitting in "launch position," securely strapped to a wheeled platform, was one of the 2-man Gemini capsules that had actually flown and been recovered from the ocean (Mercury capsules were 1-man, Geminis were 2-man, and Apollos were 3-man). Unfortunately, I do not recall which mission it belonged to. The ablation shield that protected its passengers from being cooked alive had clearly seen torturous re-entry heating, and burn marks streaked the upper sides of the craft. According to a placard on the mount, this vehicle was on loan to the school for study purposes. The University of Maryland is only a few miles from NASA's Goddard Space Flight Center (http://www.gsfc.nasa.gov/) in Greenbelt, MD, so there was/is a lot of sharing of facilities between the two institutions. No doubt that played a role in securing the Gemini space capsule. One interesting aspect about our visits to the Glen L. Martin building was that rarely was anyone else present (maybe an occasional janitor). We literally had unfettered access to everything the aerospace wonderland had to offer. It is a good thing that Jerry and I were entirely trustworthy and careful to not disturb anything. That some vandal could have so easily stolen valuable artifacts or sabotaged important research work is frightening in retrospect. Hopefully, security is much tighter today. We freely toured the facilities, peeking into test chambers, looking over scribbled notes and drawings, and thumbing through text books. Now, even though we were respectful of the facilities, we absolutely could not resist the beckoning, siren call of the open door on that Gemini space capsule. With the greatest of care, Jerry and I each squeezed our way into the two seats of the capsule (I did get dibs on the left seat, where the commander sat). In utter disbelief of the moment fate had provided us, there we were, "sitting" feet skyward in the very vehicle that had a decade ago sustained the lives of our heroic astronauts. That we were unworthy of occupying those seats did not occur to us at the time (attribute it to youthful ignorance). We might have even called a countdown and made corny blastoff noises, but I like to think not. At 17 years old, we might have done just about anything. One thing we did not dare do was to shut the capsule door whilst seated inside. I could just imagine the newspaper headlines about some professor discovering the suffocated bodies of two morons in a Gemini space capsule on Monday morning. So there you have it, that experience inducted my friend Jerry and me into that very small club of lucky people who have ever actually sat inside any type of space vehicle that had actually been in orbit around the Earth. My only remaining hope now is that this mea culpa is protected by a statute of limitations for such acts that would prevent any University of Maryland security agent from knocking on my door with an arrest warrant. * Now the A. James Clark School of Engineering – he must have donated big $$$ to warrant the name change.